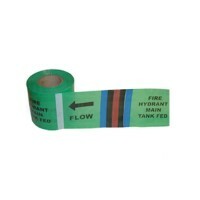 Underground Pipe Warning Tape- Campbell International Specialist Tapes. 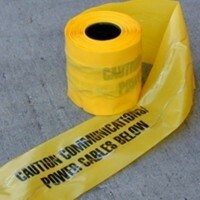 Campbell International underground warning tape is used to warn anyone digging above any pipework that there are pipes below, it is fully weather resistant and is available in detectable and non-detectable versions. 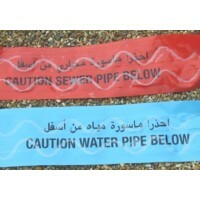 The detectable version contains metal wires so it can easily be detected by metal detectors. 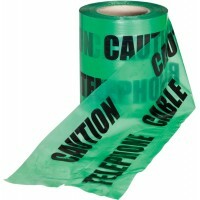 Print: CAUTION CAUTION CAUTION BOOSTED COLD WATERColour: BlueWidth: 150mmLength: 100mThickness: 150mu (0.15mm) Substrate: Virgin Grade LDPE (low density polyethylene)Ink: Highly resistant, solvent based Core: 76mm diameter cardboard corePVC Content: The tape contains no PVCAcid resistance:..
Print: CAUTION CAUTION BRINE MAIN BELOWColour: GreenWidth: 150mmLength: 100mThickness: 150mu (0.15mm) Substrate: Virgin Grade LDPE (low density polyethylene)Ink: Highly resistant, solvent based Core: 76mm diameter cardboard corePVC Content: The tape contains no PVCAcid resistance: Hig..
Print: CAUTION CAUTION CAUTION BRINE WATER MAINColour: BlueWidth: 150mmLength: 365mThickness: 50mu (0.05mm) Substrate: Virgin Grade LDPE (low density polyethylene)Ink: Highly resistant, solvent based Core: 76mm diameter cardboard corePVC Content: The tape contains no PVCAcid..
Print: CAUTION CAUTION CAUTION BURIED CABLE BELOWColour: YellowWidth: 150mmLength: 365mThickness: 50mu (0.05mm) Substrate: Virgin Grade LDPE (low density polyethylene)Ink: Highly resistant, solvent based Core: 76mm diameter cardboard corePVC Content: The tape contains no PVCAcid ..
Print: CAUTION CAUTION CAUTION BURIED PIPELINE BELOWColour: YellowWidth: 150mmLength: 365mThickness: 50mu (0.05mm) Substrate: Virgin Grade LDPE (low density polyethylene)Ink: Highly resistant, solvent based Core: 76mm diameter cardboard corePVC Content: The tape contains no PVCAc..
Print: CAUTION CAUTION CAUTION CABLE TV AND TELEPHONEColour: GreenWidth: 150mmLength: 365mThickness: 50mu (0.05mm) Substrate: Virgin Grade LDPE (low density polyethylene)Ink: Highly resistant, solvent based Core: 76mm diameter cardboard corePVC Content: The tape contains no ..
Print: CAUTION CAUTION CAUTION CATHODIC PROTECTION CABLE BELOWColour: YellowWidth: 150mmLength: 365mThickness: 50mu (0.05mm) Substrate: Virgin Grade LDPE (low density polyethylene)Ink: Highly resistant, solvent based Core: 76mm diameter cardboard corePVC Content: The tape co..
Print: CAUTION CAUTION CAUTIONColour: YellowWidth: 150mmLength: 100mThickness: 150mu (0.15mm) Substrate: Virgin Grade LDPE (low density polyethylene)Ink: Highly resistant, solvent based Core: 76mm diameter cardboard corePVC Content: The tape contains no PVCAcid resistance: Highly resistant..
Print: CAUTION ELECTRIC CABLE BELOW (English and Arabic)Colour: YellowWidth: 150mmLength: 365mThickness: 50mu (0.05mm) Substrate: Virgin Grade LDPE (low density polyethylene)Ink: Highly resistant, solvent based Core: 76mm diameter cardboard corePVC Content: The tape contains no P..
POLYETHYLENE WARNING TAPE FOR BURIED ELECTRICITY SUPPLY CABLEPrint: CAUTION CAUTION CAUTION ELECTRIC CABLE BELOWDimensions: 150mm x 365mThickness: 100micron (100mu / 0.10mm)Premium quality, plastic warning tape made from heavy duty, virgin‐grade, low density polyethylene. 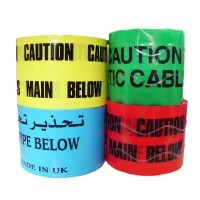 The tape is pre..
Print: CAUTION CAUTION CAUTION CCTV CABLE BELOWColour: GreenWidth: 150mmLength: 365mThickness: 50mu (0.05mm) Substrate: Virgin Grade LDPE (low density polyethylene)Ink: Highly resistant, solvent based Core: 76mm diameter cardboard corePVC Content: The tape contains no PVCAci..
Print: CAUTION CAUTION CAUTION CHEMICAL PIPE BELOWColour: YellowWidth: 150mmLength: 365mThickness: 50mu (0.05mm) Substrate: Virgin Grade LDPE (low density polyethylene)Ink: Highly resistant, solvent based Core: 76mm diameter cardboard corePVC Content: The tape contains no PV..
Print: CAUTION CAUTION CAUTION COMMUNICATIONS CABLE BELOWColour: GreenWidth: 150mmLength: 100mThickness: 150mu (0.15mm) Substrate: Virgin Grade LDPE (low density polyethylene)Ink: Highly resistant, solvent based Core: 76mm diameter cardboard corePVC Content: The tape contains no PVCAcid re..
Print: CAUTION CAUTION CAUTION COMMUNICATIONS CABLE BELOWColour: GreenWidth: 150mmLength: 365mThickness: 50mu (0.05mm) Substrate: Virgin Grade LDPE (low density polyethylene)Ink: Highly resistant, solvent based Core: 76mm diameter cardboard corePVC Content: The tape contains..
Print: CAUTION CAUTION CAUTION COMPRESSED AIR BELOWColour: BlueWidth: 150mmLength: 100mThickness: 150mu (0.15mm) Substrate: Virgin Grade LDPE (low density polyethylene)Ink: Highly resistant, solvent based Core: 76mm diameter cardboard corePVC Content: The tape contains no PVCAcid resistanc..
Print: CAUTION CAUTION CAUTION COMPRESSED AIR BELOWColour: RedWidth: 150mmLength: 100mThickness: 150mu (0.15mm) Substrate: Virgin Grade LDPE (low density polyethylene)Ink: Highly resistant, solvent based Core: 76mm diameter cardboard corePVC Content: The tape contains no PVCAcid resistance..
Print: CAUTION CAUTION CAUTION CONDENSATE PIPE BELOWColour: OrangeLength: 100mThickness: 150mu (0.15mm) Substrate: Virgin Grade LDPE (low density polyethylene)Ink: Highly resistant, solvent based Core: 76mm diameter cardboard corePVC Content: The tape contains no PVCAcid resistance: H..
Print: CAUTION CAUTION CAUTION DATA CABLE BELOWColour: GreenWidth: 150mmLength: 365mThickness: 50mu (0.05mm) Substrate: Virgin Grade LDPE (low density polyethylene)Ink: Highly resistant, solvent based Core: 76mm diameter cardboard corePVC Content: The tape contains no PVCAci..
Print: CAUTION CAUTION CAUTION DISTRICT HEATING PIPES BELOWColour: YellowWidth: 150mmLength: 365mThickness: 50mu (0.05mm) Substrate: Virgin Grade LDPE (low density polyethylene)Ink: Highly resistant, solvent based Core: 76mm diameter cardboard corePVC Content: The tape contains n..
Print: CAUTION CAUTION CAUTION DRAIN BELOWColour: GreenWidth: 150mmLength: 365mThickness: 50mu (0.05mm) Substrate: Virgin Grade LDPE (low density polyethylene)Ink: Highly resistant, solvent based Core: 76mm diameter cardboard corePVC Content: The tape contains no PVCAcid res..
Print: CAUTION CAUTION CAUTION DUCT BELOWColour: YellowWidth: 150mmLength: 100mThickness: 150mu (0.15mm) Substrate: Virgin Grade LDPE (low density polyethylene)Ink: Highly resistant, solvent based Core: 76mm diameter cardboard corePVC Content: The tape contains no PVCAcid resistance: ..
Print: CAUTION CAUTION CAUTION EARTH CABLE BELOWColour: YellowWidth: 150mmLength: 365mThickness: 50mu (0.05mm) Substrate: Virgin Grade LDPE (low density polyethylene)Ink: Highly resistant, solvent based Core: 76mm diameter cardboard corePVC Content: The tape contains no PVCAcid r..
Print: CAUTION CAUTION CAUTION ELECTRIC CABLE BELOWColour: YellowWidth: 150mmLength: 100mThickness: 150mu (0.15mm) Substrate: Virgin Grade LDPE (low density polyethylene)Ink: Highly resistant, solvent based Core: 76mm diameter cardboard corePVC Content: The tape contains no PVCAcid resista..
Print: CAUTION CAUTION CAUTION ELECTRIC CABLE BELOWColour: YellowWidth: 150mmLength: 365mThickness: 50mu (0.05mm) Substrate: Virgin Grade LDPE (low density polyethylene)Ink: Highly resistant, solvent based Core: 76mm diameter cardboard corePVC Content: The tape contains no PVCAci..
Print: CAUTION CAUTION CAUTION FIBRE OPTIC CABLE BELOWColour: GreenWidth: 150mmLength: 100mThickness: 150mu (0.15mm) Substrate: Virgin Grade LDPE (low density polyethylene)Ink: Highly resistant, solvent based Core: 76mm diameter cardboard corePVC Content: The tape contains no PVCAcid resis..
Print: CAUTION CAUTION CAUTION FIBRE OPTIC CABLE BELOW Colour: GreenWidth: 150mmLength: 365mThickness: 50mu (0.05mm) Substrate: Virgin Grade LDPE (low density polyethylene)Ink: Highly resistant, solvent based Core: 76mm diameter cardboard corePVC Content: The tape conta..
Print: CAUTION CAUTION CAUTION FIN DRAIN BELOWColour: GreenWidth: 150mmLength: 365mThickness: 50mu (0.05mm) Substrate: Virgin Grade LDPE (low density polyethylene)Ink: Highly resistant, solvent based Core: 76mm diameter cardboard corePVC Content: The tape contains no PVCAcid resi..
Print: CAUTION CAUTION CAUTION FIRE MAIN BELOWColour: RedWidth: 150mmLength: 100mThickness: 150mu (0.15mm) Substrate: Virgin Grade LDPE (low density polyethylene)Ink: Highly resistant, solvent based Core: 76mm diameter cardboard corePVC Content: The tape contains no PVCAcid resistance..
Print: CAUTION CAUTION CAUTION FIRE MAIN BELOWColour: RedWidth: 150mmLength: 365mThickness: 50mu (0.05mm) Substrate: Virgin Grade LDPE (low density polyethylene)Ink: Highly resistant, solvent based Core: 76mm diameter cardboard corePVC Content: The tape contains no PVCAcid resist..